We'll choose one winner at random on April 30, 2016. Best of luck. ELIGIBILITY: Only legal residents of the fifty (50) United States and the District of Columbia who are (21) twenty-one years of age or older are eligible to enter. Not open to employees, officers or directors (or to members of the immediate family or household of any employees, officers, or directors) of CertaScan Technologies, or any of its parents, subsidiaries, affiliates, or any advertising or promotion agencies involved in this Sweepstakes promotion (collectively, the â€œSweepstakes Entitiesâ€). Eligibility may be verified at any time. The CertaScan Free Trial (the â€œSweepstakesâ€) is subject to all applicable federal, state, and local laws and regulations. Void Puerto Rico and where prohibited. SWEEPSTAKES PERIOD: The Sweepstakes begins on 04/08/2016 at 12:00 a.m. Eastern Time (â€œETâ€) and ends on 04/30/2016 at 11:59 p.m. ET (the â€œSweepstakes Periodâ€). The CertaScan Technologies database computer is the official time-keeping device for the Sweepstakes. By participating in the Sweepstakes, each entrant unconditionally accepts and agrees to comply with and abide by these Official Rules. 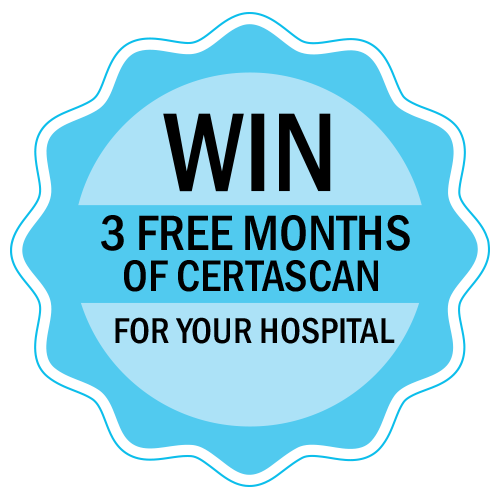 PRIZES/ODDS: Three (3) free months of CertaScan services for their hospital. No cash alternative or prize substitutions or transfers will be allowed, except at CertaScan Technologiesâ€™ discretion; CertaScan Technologies may award a substitute prize of comparable or greater value if any prize listed becomes unavailable for any reason. Winners are responsible for all federal, state and/or local taxes, and for any other fees or costs associated with acceptance or use of any prize. Odds of winning depend on the number of eligible entries received. Sweepstakes is open to all receivers of AWHONN email blast on or about 05/09/16 and any visitor to the CertaScan website during the month of April 2016. GENERAL: Acceptance of a prize constitutes winnerâ€™s permission for CertaScan Technologies to use winnerâ€™s name, photograph, likeness, voice, biographical information, statements and address (city and state) for advertising and/or publicity purposes worldwide and in all forms of media now known or hereafter developed, in perpetuity, without further compensation except where prohibited by law. No responsibility is assumed for (a) any damage to an entrantâ€™s computer system which is occasioned by accessing http://certascantek.com/ [the â€œWebsiteâ€] or otherwise participating in the Sweepstakes; (b) any computer system, phone line, hardware, software or program malfunctions, or other errors, failures or delays; (c) incomplete, illegible, misdirected, misprinted, late, lost, damaged, stolen, or postage-due submissions or prize notifications; (d) lost, interrupted, inaccessible or unavailable networks, servers, satellites, Internet service providers, websites, or other connections; (e) miscommunications, failed, jumbled, scrambled, delayed, or misdirected computer, telephone or cable transmissions; (f) any technical malfunctions, failures, difficulties or other errors of any kind or nature; or (g) the incorrect or inaccurate capture of information, or the failure to capture any information. CertaScan Technologies reserves the right in its sole discretion to disqualify any individual from this Sweepstakes and any other promotion offered by CertaScan Technologies who is found to be tampering with the entry process or the operation of the Sweepstakes or the Website, to be acting in violation of these Official Rules, or to be acting in an unsportsmanlike or disruptive manner, or with the intent to disrupt or undermine the legitimate operation of the Sweepstakes, or to annoy, abuse, threaten or harass any other person, and CertaScan Technologies reserves the right to seek damages and other remedies from any such person to the fullest extent permitted by law. CertaScan Technologies reserves the right to modify, extend, suspend, or terminate the Sweepstakes, in whole or in part, if it determines, in its sole discretion, that the Sweepstakes is technically impaired or corrupted or that fraud or technical problems, failures or malfunctions or other unintended circumstances have impaired the integrity, administration, security, proper play and/or feasibility of the Sweepstakes as contemplated herein. If the Sweepstakes is terminated before the designated end date, CertaScan Technologies will (if possible) select a winner in a random drawing from all eligible, non-suspect entries unaffected by the problem. Inclusion in such drawing shall be each entrantâ€™s sole and exclusive remedy in such circumstances. Only the type and quantity of prizes described in these Official Rules will be awarded. If, for any reason, more bona fide winners come forward seeking to claim prizes in excess of the number of each type of prize set forth in these Official Rules, the winners, or remaining winners, as the case may be, of the advertised number of prizes available in the prize category in question may be selected in a random drawing from among all persons making purportedly valid claims for such prize(s). Inclusion in such drawing shall be each entrantâ€™s sole and exclusive remedy in such circumstances. If any provision of these Official Rules is deemed unenforceable by any court of competent jurisdiction for any reason, the remaining provisions shall remain enforceable to fullest extent possible. RELEASE OF LIABILITY: Entrants (and any minor entrantâ€™s parent or legal guardian) agree that the Sweepstakes Entities (a) shall not be responsible or liable for, and are hereby released from, any and all costs, injuries, losses or damages of any kind, including, without limitation, death and bodily injury, due in whole or in part, directly or indirectly, to participation in the Sweepstakes or any Sweepstakes-related activity, or from entrantsâ€™ acceptance, receipt, possession and/or use or misuse of any prize, and (b) have not made any warranty, representation or guarantee express or implied, in fact or in law, with respect to any prize, including, without limitation, to such prizeâ€™s quality or fitness for a particular purpose. Governing Law: This Sweepstakes shall be governed by and interpreted under the laws of the State of Connecticut, U.S.A. without regard to its conflicts of laws provisions, subject to the binding arbitrations provisions below. Arbitration: Entrants hereby agree that any and all disputes, claims, causes of action, or controversies (â€œClaimsâ€) arising out of or in connection with this Sweepstakes shall be resolved in accordance with the Federal Arbitration Act, by binding mandatory arbitration conducted by telephone, online and/or be solely based on written submissions without any personal appearance by the parties or witnesses unless otherwise mutually agreed by the parties, pursuant to this provision and the code of procedures of either the National Arbitration Forum (â€œNAFâ€) or the American Arbitration Association (â€œAAAâ€), as selected by the entrant. NEITHER PARTY WILL HAVE THE RIGHT TO LITIGATE THAT CLAIM IN COURT OR HAVE A JURY TRIAL ON A CLAIM. FURTHER, NEITHER SPONSOR NOR ENTRANT WILL HAVE THE RIGHT TO PARTICIPATE IN A REPRESENTATIVE CAPACITY ON BEHALF OF THE GENERAL PUBLIC OR OTHER PERSONS SIMILARLY SITUATED, OR AS A MEMBER OF ANY CLASS OF CLAIMANTS PERTAINING TO ANY CLAIM SUBJECT TO ARBITRATION. EXCEPT AS SET FORTH BELOW, THE ARBITRATORâ€™S DECISION WILL BE FINAL AND BINDING. NOTE THAT OTHER RIGHTS THAT ENTRANT WOULD HAVE IF ENTRANT WENT TO COURT ALSO MAY NOT BE AVAILABLE IN ARBITRATION. Unless both entrant and Sponsor agree otherwise, the arbitrator may not consolidate more than one person's Claims, and may not otherwise preside over any form of a representative or class proceeding. The arbitratorâ€™s authority to resolve Claims is limited to Claims between Sponsor and entrant alone, and the arbitratorâ€™s authority to make awards is limited to awards to Sponsor and entrant alone. Furthermore, claims brought by either party against the other may not be joined or consolidated in arbitration with Claims brought by or against any third party, unless agreed to in writing by all parties. The arbitrator may award declaratory or injunctive relief only in favor of the individual party seeking relief and only to the extent necessary to provide relief warranted by that party's individual claim. No arbitration award or decision will have any preclusive effect as to issues or claims in any dispute with anyone who is not a named party to the arbitration. Notwithstanding any other provision in these Official Rules and without waiving either partyâ€™s right to appeal such decision, should any portion of this provision be deemed invalid or unenforceable, then the entire provision (other than this sentence and the paragraph below) shall not apply. To the extent that the arbitration clause is not enforceable to resolve a Claim, entrant AGREES THAT THERE WILL NOT BE A JURY TRIAL. ENTRANT AND SPONSOR EACH UNCONDITIONALLY WAIVE ANY RIGHT TO TRIAL BY JURY IN ANY CLAIM OR COUNTERCLAIM ARISING OUT OF OR RELATING TO THESE SWEEPSTAKES IN ANY WAY. IN THE EVENT OF LITIGATION, THIS PARAGRAPH MAY BE FILED TO SHOW A WRITTEN CONSENT TO A TRIAL BY THE COURT. Entrant further agree that, to the extend allowed by applicable law, (i) any and all disputes, claims, and causes of action arising out of or in connection with the Sweepstakes, or any prize awarded, shall be resolved individually without resort to any form of class action; (ii) any claims, judgments and awards shall be limited to reasonable and actual out-of-pocket costs incurred, including costs associated with entering the Sweepstakes, but in no event attorney's fees; and (iii) under no circumstances will any entrant be permitted to obtain any award for, and entrant hereby waives all rights to claim, punitive, incidental, indirect or consequential damages and any and all rights to have damages multiplied or otherwise increased and any other damages, other than damages for reasonable and actual out-of-pocket expenses. Any litigation relating to these Official Rules or the Sweepstakes shall be brought exclusively in the state or federal courts in Connecticut, and entrant hereby consents and waives any objection to such jurisdiction. FACEBOOK: By participating, you release Facebook and its parent companies, subsidiaries, affiliates, partners, employees, directors, agents, advertising agencies, from any and against any and all injury, loss or damage caused or claimed to be caused by your participation in the Sweepstakes and/or the acceptance, awarding, receipt, use and/or misuse of the prize. Any information you submit online is to the CertaScan Technologies, and not to Facebook. TWITTER: By participating, you release Twitter and its parent companies, subsidiaries, affiliates, partners, employees, directors, agents, advertising agencies, from any and against any and all injury, loss or damage caused or claimed to be caused by your participation in the Sweepstakes and/or the acceptance, awarding, receipt, use and/or misuse of the prize. Any information you submit online is to the CertaScan Technologies, and not to Twitter. WINNERSâ€™ LIST/OFFICIAL RULES: To obtain a list of winners, available after 05/06/2016, send a self-addressed stamped envelope to CertaScan Technologies, 159 Knollwood Drive, Fairfield, CT 06824. All such requests must be received by 05/31/2016. These Official Rules will be posted on the Website.